Gibsons, BC? Molly’s Reach? The Persephone chugging into Gibsons Harbour? Most people have seen the beautiful Sunshine Coast in The Beachcombers. Molly’s Reach restaurant and the pier are still there. But there’s so much more to explore on the Sunshine Coast. The Coast is just 1.5 hours from downtown Vancouver, but can only be reached by ferry or air. It makes for a different world. The 40 minute ferry ride through Howe Sound is like a mini cruise. The pace of life slows, relaxation sets in. 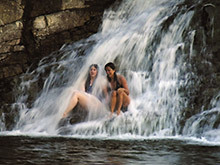 Upon arrival, mountains and forests with hundreds of kilometers of trails await the visitor, together with beautiful beaches, lakes, stunning ocean views and the Skookumchuk Narrows, the second largest salt water rapids in North America. The Pender Harbour area is known as the Venice of the North. 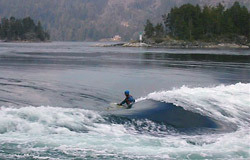 For outdoor enthusiasts, the Sunshine Coast is a great place to visit. 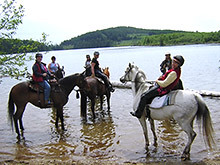 Hiking, sea kayaking, sailing, canoeing, golf, fresh and saltwater fishing, beachcombing, swimming, wakeboarding, snowshoeing and cross country skiing. The mountain biking is world renowned and the cold water diving near Saltery Bay, Porpoise Bay and Halfmoon Bay on the Georgia Strait ( www.britishcolumbia.com/recreation ) are among the best in the world. A boat trip to Princess Louisa Inlet and Chatterbox Falls is unforgettable. So much to see, do and enjoy, and no crowds. At many of the lakes, you may be the only visitor. The sounds of birds and the gentle crashing of the waves are everywhere. Local people are friendly and relaxed. Browse around in antique shops and quaint little stores with collectibles, or dine in waterfront restaurants, bistro-style cafes and other picturesque local eateries for a variety of flavors and budgets. The Coast Cultural Alliance has information about literally hundreds of artists, events and gallery exhibits on the Sunshine Coast. Many artists will welcome you in their studios. Music lovers will be happy on the Sunshine Coast, too. On weekends, there is always something going on. The Coast boasts many musicians, with styles ranging from jazz to rhythm ‘n blues to eclectic, to classical. The Powell River Academy of Music and its many concerts are certainly worth a visit. How sunny is the Sunshine Coast? Well, it lies nicely sheltered behind Vancouver Island, so the climate is mild. In fact, the Sunshine Coast is the second warmest region in Canada. A section in Roberts Creek on the Lower Coast is even officially designated as subtropical. With an annual total of between 1,400 to 2,400 hours of sunshine – that’s an average of four to six hours a day, depending on where the measurements are taken – bright days outnumber gloomy ones by a wide margin. At higher elevations, there is snow in winter for snowshoeing, cross country skiing and sledding amidst spectacular scenery. There are actually two Sunshine Coasts: the Lower and the Upper. To reach the Upper Sunshine Coast, one needs to drive 77 kilometers along the Sunshine Coast Highway to Earl’s Cove, where you board a ferry to the Upper Sunshine Coast. A relaxing 50-minute trip among breathtaking scenery. 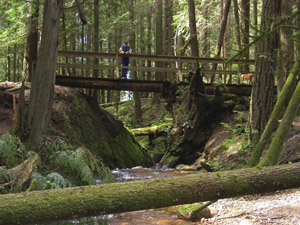 The Upper Sunshine Coast, with Powell River, is an area with pristine beauty and a vibrant cultural life. For those who enjoy scenic ferry trips, there is the Circle Tour: a ferry ride from Horseshoe Bay in West Vancouver takes you to the Lower Sunshine Coast, then a drive and another ferry trip to the Upper Sunshine Coast. In Powell River you board another ferry to Comox on Vancouver Island. The fourth ferry ride is either from Victoria (Swartz Bay) in the South of Vancouver Island to Tsawassen, just South of Vancouver, or alternatively, from Departure Bay in Nanaimo, back to Horseshoe Bay. A special Circle Tour ticket from BC Ferries can provide savings up to 30 per cent. 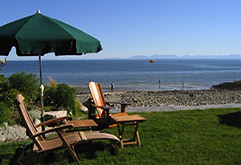 The Sunshine Coast Bed and Breakfast and Cottage Owners Association (SCBBCOA) offers visitors some of the finest accommodations on the Sunshine Coast. Each of our member properties must adhere to some of the most stringent standards in the hospitality industry, assuring our guests of a positive experience in a quality lodging. Whether you are looking for a quiet cottage in the woods or a luxury B & B on the water, a family vacation, a romantic getaway or even a place to relax with your pets (yes, we have members who specialize in this, too), our accommodations never disappoint. With over 120 properties from which to choose you are certain to find the one just right for you. 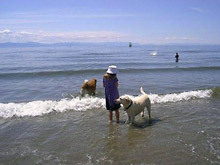 Come to the Sunshine Coast, just minutes away from the busy Lower Mainland, and enjoy our hospitality.